Starting from February 2018, he has been heading the newly created Engagement department of BNP Paribas Italia, with the aim of developing the positive economy engagement of the Group, in coordination with the same Head Office department in Paris. 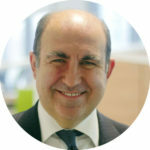 He is a member of the BNL Group BNP Paribas Executive Committee and Board member of the BNL Foundation and Ifitalia. In the Group he has always acted as a coverage officer and relationship banker for top corporate clients, coordinating the various product lines in their offer to the top strategic clients of the Group.